The significant ability of Xpadder is to support almost any controller device: this controller mapper allows you to add each button or analog element that your controller has one-by-one. As a result, you literally build a unique scheme. Once the controller is plugged in, Xpadder asks you to move analog controls to add them to the controller scheme and tune the deadzone. The next step in this controller mapping software is to configure the layout: you can drag the controls and make a mess. Then you create a config and add mappings but unfortunately only the keyboard ones. So you can’t eliminate the native layout in games that have controller support from-the-box or even change it a little bit, so you might want an Xpadder alternative to do that. Still, it’s an awesome gamepad mapper for a game that doesn’t support controller. Still, I have some questions to this controller mapper. The interface itself is a bit confusing. Two toggles can’t work together: once you activate the second toggle, the first one stops. You also can’t drag the elements in the macro editor, which I found uncomfortable. I wanted to try the iconic “hello world” phrase as a macro sequence, but Xpadder didn’t let adding the second and the third L letter. I figured it out by adding sequence pauses after each element, otherwise, it did not give me the result I was looking for. If you’re looking for a handier macro editor you might want an Xpadder alternative. And I also really needed the tooltips, they would make using Xpadder way easier. 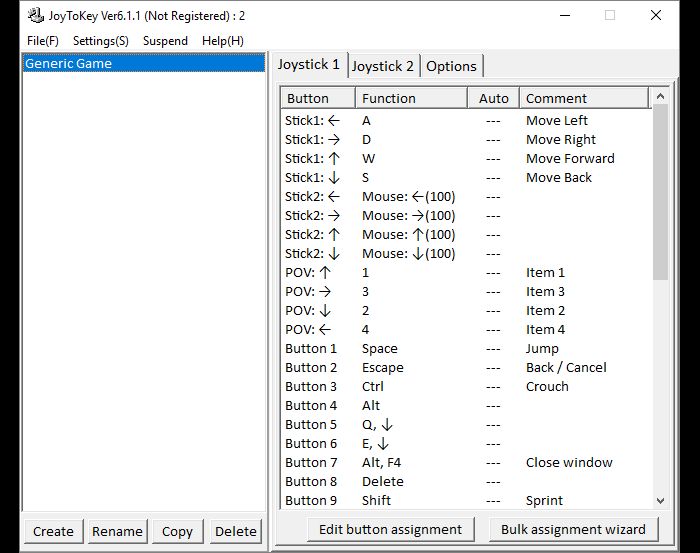 JoyToKey is a fairly good and functional controller mapper with a bit weird interface, and lots of hidden treasures. The hierarchy is the following: you create the profile, then add your joysticks with different configs. You also can change stuff in Button mapping (which I’ve called a hidden treasure because it took me some time to find that useful section). This gamepad mapper also permits to change the profiles by clicking a certain button (or a combination). Another cool thing is that you have plenty of opportunities concerning mappings: map a key, a key combo, mouse move or the mouse absolute position movement, toggle or auto-repeat. Activators are available as well. A few things I didn’t like in this controller mapper: you have a strict limitation with the combo sequence number, it’s four elements. So if you want to make a bigger combo, you might want a JoyToKey alternative. Also, the faceless button names (Button 1, Button 2, etc), glad that you can add the commentary that will make it clear for a certain joystick. And lastly, I found really uncomfortable the fact that to bind a mouse to the stick, I need to assign all the directions separately. It takes quite a long time and the stick deadzones were also tricky to find. What’s also impressive — this controller mapping software offers you masks. See, you have 32 buttons at your disposal. Some of them are the actual physical controller buttons, from Button 1 to Button 12. Starting from Button 13 — those are kind of empty slots, and if you head to Button mapping section, you can bind Button 13 to Button 1 + Button 2 combination, as an example. And then assign a keyboard key to Button 13, which will reproduce as Button 1 + Button 2. This controller mapper has a bit complicated shift mode, but if you master it — you can move mountains. Although, if you find this too complicated, try a JoyToKey alternative with easier Shift mode. Pinnacle Game Profiler amazed me with two things: this controller mapping software has a huge ready-to-use config base, and a full keyboard layout mapped to sticks. Also, it’s pretty sweet that you need to head through all the tuning process for your newly-plugged-in gamepad, and you don’t miss any important settings. You can launch the game or an app right from the controller mapper menu, which is an exceptional and cool feature. First, you pick the app, then — the controller, then — the config. If you don’t have configs for a certain device, you need to create one, which is not really comfortable. The gamepad mapper itself is good and has lots of functions: regular mappings, force feedback, cycle, and double commands. 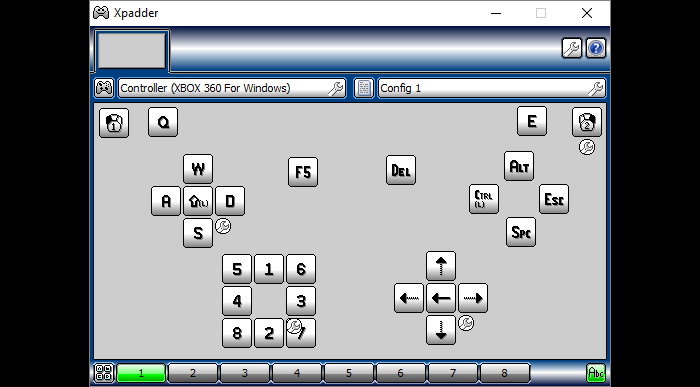 Pinnacle also has an enormous list of possible keyboard bindings, I won’t be surprised if you find the “world peace” button there. You can set a Shift layout too, which, unfortunately, can only be a single one, and Pinnacle GP doesn't have many options for the Shift modifier (only Press and Hold). Still, I’ve got some questions to this controller mapper: mouse emulation is a bit weird, if you assign it to the stick, it mostly reproduces at a square/rectangle trajectory while you move the stick around. And I didn’t seem to find the appropriate settings to tune it. Mouse smoothing applies to your actual mouse too, apparently, because once I applied and tried the first config my mouse started behaving differently. Once I turned Mouse smoothing off — it was back to normal. Another thing that bothers me is the windows in this controller mapping software… All those popping up windows to get lost in. To create the cycle command I had to go through three windows (if I don’t count the first two that lead to the config itself). Also, this controller mapper has no hardware mappings, which makes me wonder, how can I create the PUBG controller support setting? Or Elite Dangerous? Overwatch? I suppose that’s impossible. 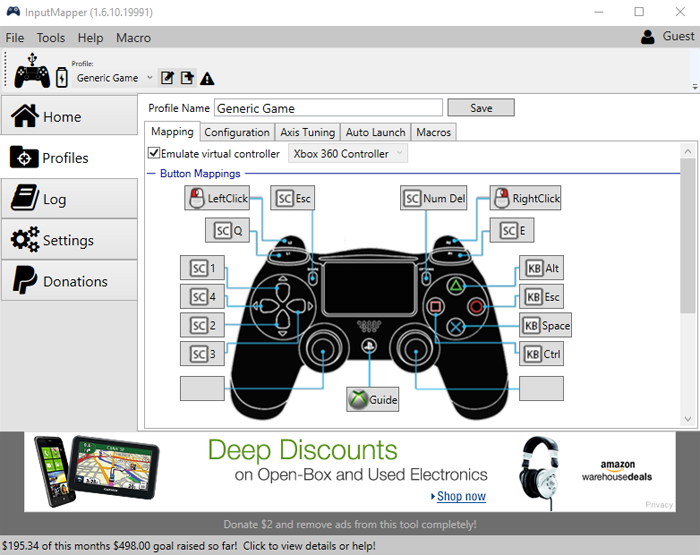 A great controller mapping software for PS4 controller — InputMapper — is famous with its ability to create the hardware, keyboard, and mixed macros, that’s the strongest feature I’ve found. It also has an interesting macro logic (macro triggers marked as green for a macro working, and as red — to pause one). As this controller mapper was initially designed to remap the DualShock 4 controller, it has lots of specific features that other apps don’t have. Like, tuning the Led light, lots of settings for the touchpad, gyro, accelerometer, etc. The interface is quite decent, the tabs are well-organized and it’s pretty clear where to find the things you need. I still have some questions to this gamepad mapper, and the first one goes to the macro editor. Most games won’t react to the combo unless you have 20 to 40 milliseconds pause between the elements of a sequence. That means you need to add each pause separately, which is not quite handy. Otherwise, the combo will not work. Also, I’d like to see the visual representation of what I am doing to my Sticks because changing a Curve from 0 to 100% doesn’t seem to change anything. This controller mapper also doesn’t permit to add haptic feedback to a certain button, only tune its force in settings. 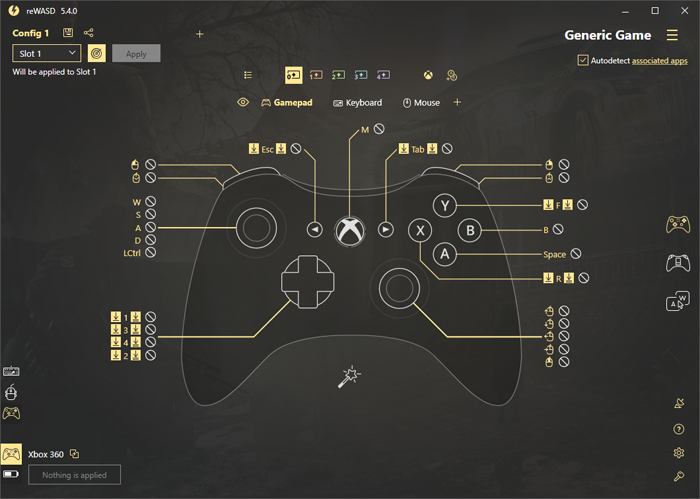 The newest controller mapping software — reWASD — has quite a comprehensive interface: every button has the menu with ALL the mappings you can add to it in one place (activators, rumble, turbo, toggle, gamepad (hardware) mapping and key combo). 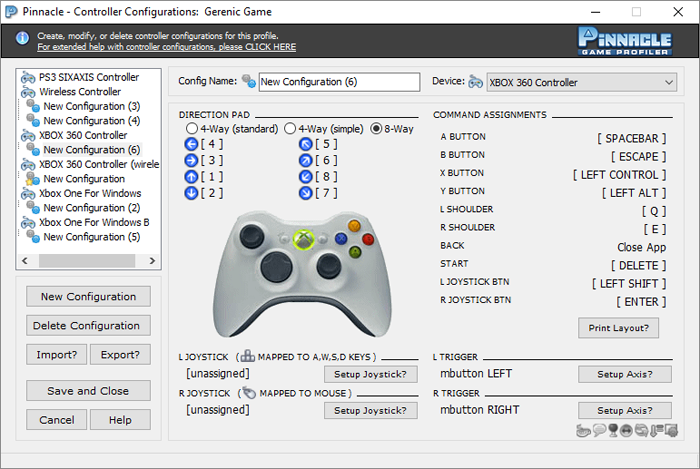 First, you need to create a game profile, then you’ll reach to the controller image with all the available controller buttons. You can hook both controller and keyboard buttons to make the remapping process quicker. The peculiarity of reWASD is that it can remap Xbox Elite paddles, and turn off the native controller behavior completely — add unmaps, that is crucial for the games with native controller support and is missed in above-mentioned apps. And then, add keyboard or controller mappings on top of that. Also, the macro editor has way more intuitive and handy interface, comparing to other mappers: drag and drop the elements of a sequence, add pauses between all the elements, add combo breaks — all in one place. And about controller combos, that are also possible? Awesome! This gamepad mapper also has an option to add Shift modifiers, which also look and work great. You can add up to 4 Shift modifiers to a single layout, thus, 4 new layers of mappings. Shift layouts can be activated by a toggle modifier, or while the modifier button is held. Another great feature — this controller mapper permits to do hardware mapping, which means swapping controller buttons, which is also unique. Also, a big user community, where you can store all your configs, or check out the ones other users uploaded. Needless to say about social stuff: YouTube, Discord, Facebook, Pinterest. We really hope this short controller mapper review will help you make the right choice. There are plenty of options, although, you still need time to pick the perfect one. Let us know about your favortite controller mapping software in the comments below! If you have any questions or suggestions, you can contact us in the comments below, via Facebook messages, reWASD Forum, or Discord Channel. And don't forget to follow our Pinterest page for more news!